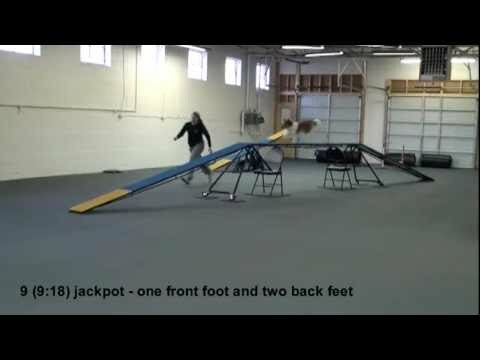 This is from a recent handling seminar (with Anthony Clark) and I was so pleased to do the running frame and get to the backside of the jump afterwards -- so had to send this in! In the seminar he made every contact but they were high and his rear feet were quite close together. That sequence sure looked too easy for Bender! 🙂 And yes, handling a running A-frame is very easy, probably easier as handling a stopped A-frame as you don’t need to even look back to see when you can release 🙂 Being in every time in different sequences that you ran, indoors and on a new DW, is actually very good, even if he was high. I would keep working on deepness and separation at home, but if he can be in every time in new environments, that’s very good already! Yes that sequence was easy for Bender! That’s because after your Foundation course -- everything seems easier. Bender has amazing tight turns that we always get complimented on -- thanks to all of your cik & cap training. Now we are working on his speed…. I think he is actually faster as you think 🙂 He seems to move, jump and turn very similar to Bu and people always think she is terribly slow when they watch her (and so it feels to me too, when running her) -- and yet her times are VERY good. I think you will get the same effect with Bender. He even seems to have the same problems on a DW as Bu had, new DWs were very hard for her at first: but it just got better&better. She never has nearly as good separation as Bi though, but it’s true I didn’t pay so much attention to that back then. Thanks for the compliments for Bender and comparing him to Bu. It seems he has inherited her thoughtfulness. 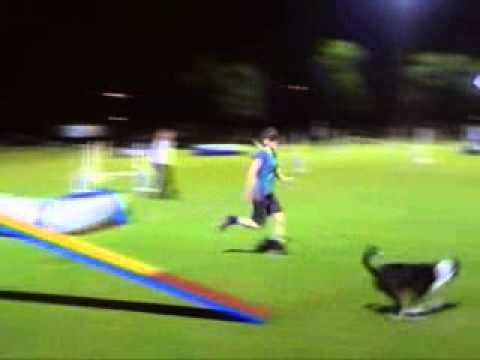 I know it is hard sometimes to see speed when the dog is being very efficient! Just hoping with lots of experience he can get used to new environments and DWs. Here is yesterday’s session on Gary’s DW (2 inches narrower). This is the second time at 32″. I didn’t include the first two runs because he was leaping and I know when that happens that the down ramp is unstable so we added supports and the leaping disappeared… I was so pleased with his speed and extension -- haven’t seen that before on this DW. And of course very excited with the jackpots and getting in with his front foot and being so deep in the yellow! He certainly is doing some adjusting with his striding to get those deeper hits. And yet his rear/front/rear hits are still high. Definitely great to get some different stridings too and some really nice deep hits! 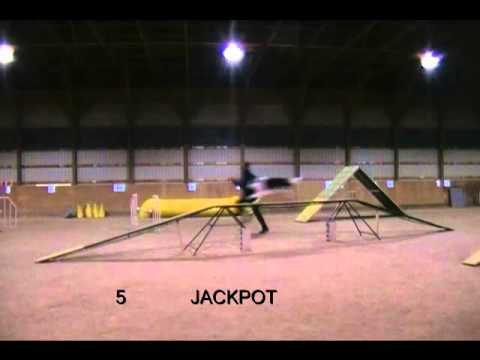 Those 4.5 strides tries sure look great, but yes, 4 strides are barely enough… Would be great if he learns all he possible stridings, 4, 4.5 and 5. We will be doing one last event next weekend, tryouts for WAO but I will be running Shimmer not my masters dog, just for experience, so that will be interesting! Turns are still not really going well, she just slows down way too much. So I am going to try and run her in extension off the DW if at all possible, and if not then I might ask for a 2o2o. Kriszty, after the table on your second video it’s just black? I can’t see it either.. Sorry, dont know what happened with the editing there..I am not talented in this area! I only wanted to include the DW anyway, the rest is just a normal novice course (and you cant see the AF because the videographer was standing on the wrong side). Wow, those sure were beautiful! Good luck next weekend too! Bu has a syndrome of slowing down too much if I do too many turns or other challenges too, so I mostly simply do straight exits and just do a turn here and there to check if she still knows them -- that works much better for her as drilling turns. Anyway, good luck with the future training and don’t hesitate to post a video under “our training” -- running contacts section if you have a question later on. taken on November 30th. After that we’ve had a break. I concentrated getting her good speed back and rewarding running fast on a plank between 2 tunnels, not paying any attention whether she hit the contact or not. Since I only get to train rc’s only 1-2 a week during winter time, I think we’ll keep training by ourselves for next few months and watch necessary tips from all these videos (I guess class room stays available for a while after this class ends?) and then we’ll join back after that January rc class. I hope you are having another rc class in spring? Thanks, I’ll start with that DW board now. And hopefully you’ll have that rc class starting on June. Timing would be perfect for us 🙂 Or then we’ll just come to one of your camps next year and do finishing touches on our rc’s there (Puppy 1 class plans to come over on April..) 🙂 But I do think that I have some idea now what to aim for, watching all the videos other students have posted and reading your comments really helps. Wow, she sure is fun to watch, what a speed! Great job! Hope to see you again either at the camp or another class! Here is some video of the 12ft planks VS 10ft planks. So, with that said how do you get a dog to get more front feet hits ? Starting from different points on the dw I dont think would do the trick since she doesnt have a ton of speed from a stationary position which will result in her wanting to hit with her back feet. Today I went back to the Manners minder treat machine (where her original RC training started). Clearly, the ball just isnt working out. She does do allot of thinking with the MM, but Im hoping once its in sequence and I take the machine away she’ll speed up. I don’t see plank video? But why would you want front feet hits? Hind feet hits are o.k., she would just need to reach further and separate them more to be more safely in. MM tries didn’t look like going in that direction, so I doubt that will help any, but plank work might, so I would sure like to see that video! It’s certainly good they know how to hit with front feet too, but on normal full extension tries, I definitely prefer hind feet and that full extension is what is missing here -- MIGHT be that because of MM start as you clearly don’t get much extension with it. Front feet might be better for turns though, so you can maybe start some of that, but I would do it away from a DW for now to not get even less extension and focus on that for now on a DW. I was hoping the front feet hits would help with her to extend those front feet 2-3″ inches when she went back to her rear feet style.. Like you said I know if only she would extend that last stride she would be nice and deep. 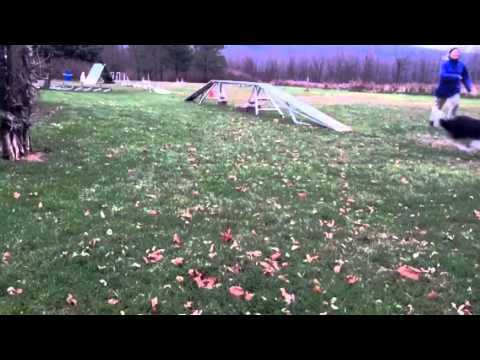 Here is some video of 2 planks very low. The single flat plank video is not wanting to upload right now and is driving me crazy! Interesting, she is almost overreaching here… I think I would do some more work on a plank and try to select for nice, two-feet hits in the middle of the contact. Would like to see the plank video too when you manage to upload it. Can you explain how overreaching in her case would be a bad thing ? I’m just trying to figure things out and I thought her issue was lack of extension / reaching ? The reason overreaching is bad is because they can overreach the whole contact -- she is again touching it very high only. It’s actually often a result of shortening the last stride, but then a momentum takes hind feet further ahead as we would want too: can be so far that she misses the contact all together. If she didn’t overreach but stride normally, you would have a very nice 3-feet hit, so it would be perfect if you could get that! With her full height dogwalks the issue is those front feet; if only I could get 1 of them to touch the yellow contact “line”; her back feet would be nice and solid in the contact. I guess I’m just looking for a way to get those front feet deeper or on the “line” with the full height contact. Also, I don’t think her problem are front feet. Her problem is shortening the last stride, therefore hitting higher + not separating hind feet much. Are you talking about overreach as in her hitting her front feet right near the contact and not putting her back feet down on the contact ? I dont think she would overreach because she hasnt done that in 7 months of “ball throwing” running contact training. I would think that if she wanted to do that it would show up by now. But at this point, 11 total months of rdw training…. anything is possible LOL. I agree if only she would extend that last stride everything would be nice. 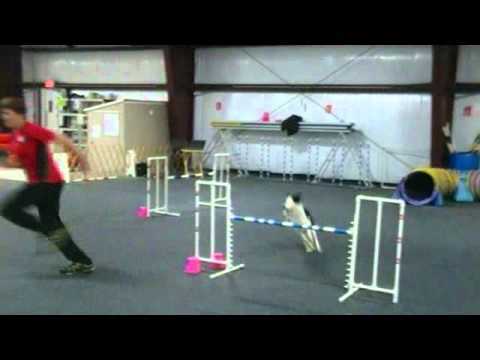 I just dont know how to do it as it appears my dog thinks only way to meet criteria is with her back feet on / in the contact zone and as a result it seems she doesnt want to extend her reach / front feet on her last stride. Ok, I will wait for your video. She is a smaller bc, with a shorter stride. So should I expect her to spread them across the entire contact like Bi and the larger BC’s do ? So the plan of action now is to just run over a flat plank to get her to hit with her back feet solid in the middle of the contact with rear feet ? Or should I be doing something else ? Yes, that’s what I would go for. Of course, dogs are striding differently naturally, so maybe she will never spread her hind feet that much, but she could definitely have better separation if she didn’t shorten that last stride. I will soon, I then also taped Le’s progression on turns and will post it all together soon. Silvia, Google made some changes to You Tube and I thought that I had it figured out what I have to do to upload videos, but still can’t. I spent about three hours working on it today. I raised the DW from 104.1 cm, where he was hitting most of the time, to 109.2 cm where he lost almost everything we have gained. I tried placing a hoop at the end of the DW and as you have said before, “that will not work” and it didn’t. With the progress that I had been making I decided to enter three trials in January. Now I feel that I should pull him out because it does not look like I can make it by then. I don’t know if I can stand not trialing for four months. Raising the DW 2.5 cm at a time is difficult. Even when I was at 104 cm Max was high in the contact zone, which sometimes would be a miss in USDAA. Do you feel that it will do any good to go back to the 104 cm height and change the tunnel distance to get him to hit in the middle of the contact zone? It’s been about 2 ½ months and I have not been able to teach him to adjust his stride so that he is in the middle. Have I reached the point where I’m wasting my time? I forgot to tell you that he is leaping again and that his rear leg separation has decreased. His speed seems to still be very good. Did you see “upload” button in top right corner after signing in to YouTube? If you click that, there is a box where you can simply drag your video. As for wasting your time… Depends how you define it. We have people here who will be taking their third RC class in January. And we have some who got to full height in just one class -- but not many, so your case is not unusual at all, teaching them to adjust the stride takes time and patience and you need to decide if you have it or not. Training it under the pressure to compete on that or another date is never a good idea. Normally, trialing while at the beginning stages is not a problem -- might not be the best idea at this point, but it’s still better to keep trialing as training under pressure, so… And yes, I would go back to his good height, but challenge him some with different approaches (different distances, but also different angles, including no-speed 180 degrees angles), going back and fourth between easy approaches and challenging ones to keep successful rate high, while trying to challenge him some more. I found the “Upload” button and I could drag a video that had been uploaded already to the “Feature Box”. But could not get a video from my computer in “iMovie” to drop anywhere on the youtube page. The strange thing is that I upload a 28 second video of a weave exercise I wanted my students to work on and it was fine. A hour later I tried to upload the video for you and it didn’t work. I made changes to the video 3 times and each time it would not upload. It looked like it was doing fine, but I didn’t receive any feedback from youtube that it worked. Strange… Computers are sure strange sometimes. After several hours on the computer and phone I’ve found out that the file was corrupted. :o( It’s raining again today, so don’t know when I can get more video. I did run him last night at the club on all of the contacts and gave him his old command for 2o2o, but released him as soon as he was in the contact zone. He is not only running the faster in the equipment but also faster on course. I think he is having more fun than before starting your class. See, you were not wasting your time afterall 🙂 I would recommend you keep trialing with 2on2off for now and do some running in free time, I’m sure it will click at one point! Hi Silvia, I sending video of Saga’s last 3 sessions. The first was at 30″, she was 100% so I raised it to 34″. Overall, I’m happy. To me it looks like she’s adjusting her stride on the second half of the horizontal board when she is in. Eager for your feedback. I’m planning on taking the next rc class with saga. I’m still working up contacts with Twitch so we’ll see where she is in a couple of weeks. Also, I’m interested in your handling class, should I start with the foundation class first? Looks great! She does shorten that last stride to get in yes, so she is obviously getting this, it’s just that she finds it too hard sometimes and just leaps off. But I think it will actually get easier with height -- and experience of course, so just keep working like this. It’s good to do Foundations first as Handling is taking some concepts we learn there to the next level, but it’s not necessary, we have many people who came directly to Handling and are doing a wonderful job. We also have some that took Handling first and then Foundations to work some more on little details, so there is actually no need for a particular order -- you can simply choose whatever is of more interest for you! Thanks for your feedback. I think we’ll do Foundations class first. This will give me a little more time to really focus on the dw. This is probably my last post until the new class. I want to wish you Happy Holidays and New Year!!!! Thanks, best wishes to you too! See you in next classes then, Foundations will start end of February! Here is Spec on a lower DW, 36″. He leaps the 2nd apex sometime but others his rear feet are first at the top of the down ramp? What do you think? Where should I go from here? The reinforcement rate is definitely higher than it was on the higher 48″ DW. Well, he is definitely trying really hard! I would keep working on this height for a while, successful rate is high enough now, so let’s just give him time to sort out his striding -- he sure is trying! Wouah Maureen, this is much better ! You gonna make it soon. I have done 4 sessions with Nessa at about 39″. The first session went very well. Out of 15 tries all were rewarded and most were jackpotted. I had a mixture of front and back feet (4 two front feet, 3 two back feet, 8 one front foot and two back feet with varying separation), The second session did not go as well and I wonder if she was tired and my throwing was definitely not good and affecting her. She was often too high in the yellow with only one foot. There were some good ones -- 6 out of 13. The next week we tried again most were jackpotted. Of the 12 -- 3 two front feet, 3 one back foot (but other one close to the yellow and good separation), 4 one front and two back feet, 2 two back feet. Here is the video from our last session. Most of them are one front and two back feet or just two back feet. One was two front feet. 4 I did not reward at all. We had some problems at the beginning. Note that the second try she struggled to stay on the dogwalk at the beginning. Her back feet separation has definitely improved from the first session where a couple were close. Where do we go from here? I don’t think that it will be possible to raise up the dogwalk and keep it stable unless we go to full height from here. I have been rewarding with placed toys after a low jump and throwing a ball at the same time. She goes for one of the placed toys after the jump and not the ball. This room is also not very big. There is a narrower longer room but it is not always available and more difficult to set up. 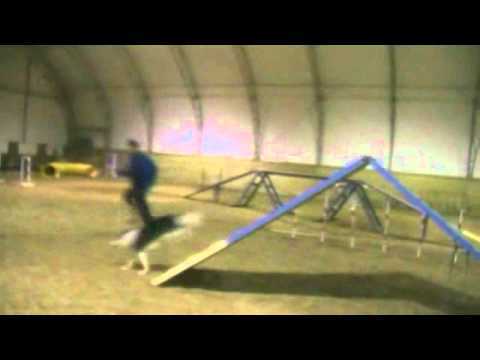 Here are some A-frames (full height) with some teeters at the beginning too of the last two (between the 3rd and 4th clip she slipped off the side of the teeter a bit which is probably why she is more careful in the 4th clip). She has varying separation of her back feet on the A-frame. Does she have enough when she has more separation? Great, her A-frames look good, so I wouldn’t worry about it, she is nicely deep in every time. Not sure why, but on a DW, she lost some extension and is sometimes missing with 5 strides what definitely means she is not running full speed. It gets better by the end of a session though, so maybe it’s because of a small room? Try to run more yourself because we do need more extension for the full height. If that works and you get consistently low hits, then you can go for full height next yes. Thanks SIlvia. It is great to know her A-frames are good. Sometimes at the start of a session (especially just after raising the height) I went back to starting her from a sit (maybe I was being too cautious as I wanted her to be used to the new height). This probably slowed her down. I tried getting more speed yesterday by using a tunnel. I may have got more speed (need to check the video to be sure) but I got more jumping. Only 2 good ones of out a guess of about 8 or so. I went back to using a jump instead and still got more jumping than usual but not as bad as with the tunnel. I should be able to get some extra practices in over the holidays since I am off of work now until January. Perhaps I can get the longer room too. Hope to have more progress to report when the new RC class starts in January. Have a great holiday and best wishes for the new year! Best wishes to you too! I was hoping more speed will only take her deeper… Is she now doing 4 strides or why did she miss so many? And she was actually jumping or just being too high? How is her hind feet separation now? I just looked at the tunnel videos (11 tries) from yesterday and it wasn’t quite as bad. I rewarded one that was high (only one back foot in the yellow) and jackpotted 3 (1 two back feet and 2 two front feet). She seems to have a problem when she lands on the down ramp with back feet first. Though she was able to get her front feet in when she came over with back feet landing first twice (the times she got a jackpot). 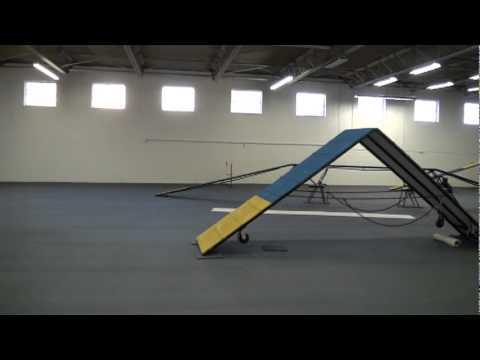 The time when she got her back feet in the yellow she landed with her front feet first on the down ramp (5 strides). When she misses the yellow it is either from quite far (1/2 the length of the contact zone or really close on a couple of tries with a bit of separation). Yes I think she is doing 4 strides when she is missing. Her hind feet separation varies. I haven’t looked at the tries yet that I did with the jumps afterwards. 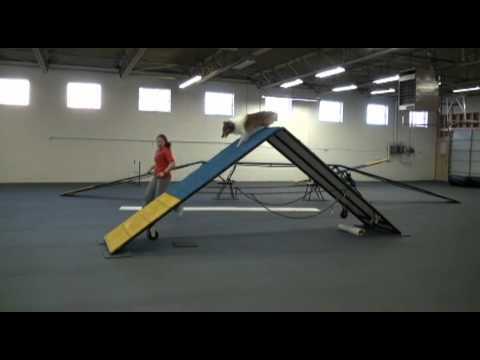 I looked at the videos again and sometimes she is straddling the join of the flat and down ramps with her back feet (i.e. only getting one back foot on the down ramp after the apex). Yes, she will probably need 5 strides: front-rear-front-rear on a down ramp, so try to find the approach that gives you those. You can wait with completely straight approaches until you get to the full height as 4 strides will be less tempting then. Barb and Mercy here. Just wanted you to know that we did not give up, but had to take a break due to my ham string injury (fourdations break too) My friend Terri ran him on the dog walk once a week for me, so he has been able to get some DW action while I was down. Love your LD classes.